Recorded on June 1, 2018. Why is that so? Figuring out "what works" from observational data is theoretically impossible and, for practical purposes, very difficult. The apparent lack of research efforts merely reflects this reality. Treatment efficacy is ultimately a causal question, and causality cannot be inferred from observational data. And, medical records are just that, i.e., non-experimental, observational data. Neither large amounts of data nor advanced statistical techniques can overcome this fundamental limitation. In this webinar, we illustrate this challenge with a particularly twisted example of Simpson's Paradox. Of course, the gold standard for establishing causal effects is running an experiment, which is not an option in many research contexts. Where does that leave us? Can we say anything about treatment efficacy from the avalanche of newly-generated patient records? While there is no true substitute for experiments, we can make some theoretical assumptions that allow us to estimate causal effects given these assumptions. Of course, as assumptions can be wrong, any researcher would endeavor to make as few as possible. This is where Bayesian networks and BayesiaLab come into play. 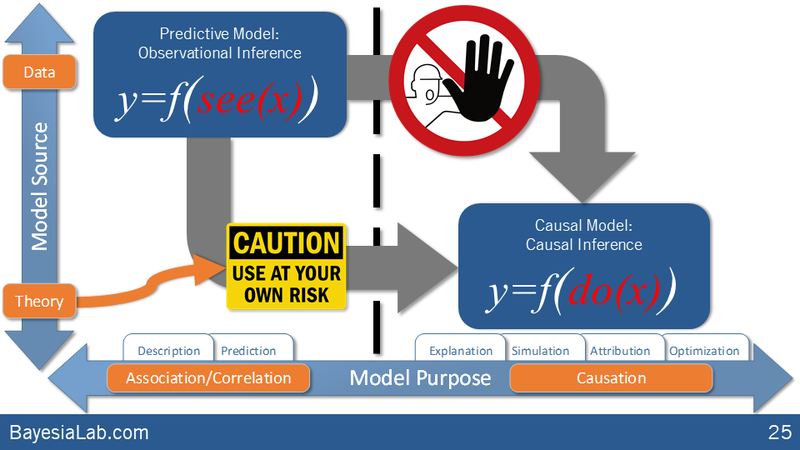 Bayesian networks can help us identify what minimal causal assumptions are truly required for effect estimation purposes. And, BayesiaLab can immediately perform the effect estimation based on those assumptions. In this webinar, we showcase a complete research workflow, from importing patient data to computing the effects of different treatment policies, including their interactions. All data sets and the corresponding Bayesian network modes will be available for download after the webinar. President Obama's prepared address on health care reform to the American Medical Association, as released by the White House, June 15, 2019.